On Feb 10th, news came from the Xianning Municiapl Tourism Commission that Xianning City attracted 2.602 million tourists during the Spring Festival holiday, an increase of 10.6% year-on-year, achieving comprehensive tourism revenue of 1.316 billion yuan, up 11.8% compared to that of last year. During the Spring Festival, cultural tourism themed activities, like hot spring tour, skiing tour, relative-visiting tour, rural folk custom tour, Multicolor Lantern Festival and New Year Shopping Festival all have injected great momentum into the Xianning Spring Festival holiday tourism market across-the-board. What’s more, holiday theme activities launched by various major hot spring attractions of Xianning City, such as “bathing in hot spring + Spring Festival extended product portfolio”, “welcoming the New Year and getting blessed by bathing in hot spring”, “the arrival of the God of Fortune brings fish spa and gold bar”, were much loved by the tourists. 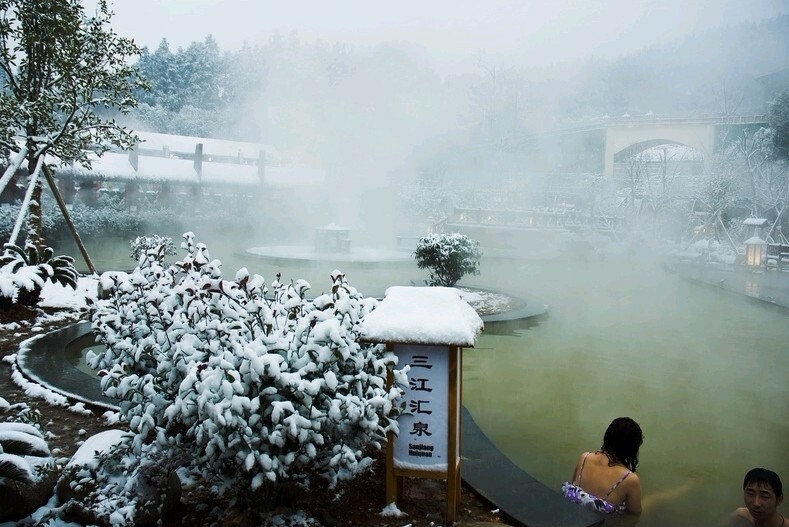 According to statistics, during the Spring Festival holiday, hot spring attractions across Xianning have received more than 20 000 tourists daily. New tourism experience products promoted by Jiugong Mountain ski field, including admiring snow, skiing, recreation and “sheer sightseeing” one-day tour, etc have seen a peak of the tourist amount. As the pertinent responsible person of Jiugong Mountain scenic spot introduced that this scenic spot has received 3700 tourists per day at most. Most are family tourists by self-driving from neighboring Wuhan and Changsha, and celebrating the Spring Festival in traveling becomes a new fashion. Except for that, scenic spots have launched a series of marketing and promoting activities highlighted by traditional cultures of the Spring Festival and Southern Hubei folk custom characteristics, which aims to immerse tourists in a strong atmosphere of the Chinese New Year during their trips. During the Spring Festival, in the great occasion of successfully building the National AAAAA tourism attraction and National Primary and Middle School Students Research & Study Trip Practical Education Base, Chibi City has hosted the 4th China Chibi Colorful Lantern Festival and the 1st New Year Shopping Festival of the Three Kingdoms, which mainly revolved around admiring Chibi multicolor lanterns and appreciating the Three Kingdom cultures, and gave tickets of the Colorful Lantern Festival as free gifts to the tourists, while it also shared the essence of history and culture with tourists, and bridge the gaps between relatives, friends and lovers, providing a delicious Chinese New Year cultural feast for tourists from surrounding cities of Xianning region and all over the country. The much abundant and colorful local characteristic programs, such as the “three and a half comic talk”, “clam fairy opera”, “rough guy dance”, “colorful lantern rap” and “collective performance of folk songs” of the 4th Xian’an New Year Shopping Festival and the 3rd Gaoqiao Town Folk Custom New Year Shopping Culture Festival have received great popularity among the tourists. In the meantime, Zishanhu Honeymoon Bay rose garden held the 2019 Xianning New Year Large Dreamlike Lighting Art Festival; Aerospace Science and Technology Museum launched activities like “sending New Year greetings”, “collecting Fu (a word means good luck in Chinese) to win the awards” and “Xiaolong prospers the Spring Festival”; and squirrel tribe has come up with discount packages activities, for instance, the “one ticket for all” Spring Festival direct online sales, which has attracted a great number of local citizens and tourists from other provinces to join. From the 3rd day to the 5th day of the 1st lunar month, Xianning Aiche Self-Driving Tour Club has organized a large group to take businesses, receiving orders of self-driving clubs and groups from Jiangxi, Guizhou Province and clubs from Wuhan and Ezhou within Hubei Province for more than 10 times. Starting from Xianning downtown area and passing through various scenic areas, including Chibi Ancient Battlefield of the Three Kingdoms, Jiayu light year castle, Shimen Village of Tongshan Guyi New Village and Chongyang Eurya Town, etc., they made it a 1-day or 2-day tour route, which have been welcomed by tourists. As pertinent responsible person of the Xianning Municipal Tourism Commission introduced, the Municipal Tourism Commission has strictly conformed to the relevant stipulations and requirements of the 24-hour duty system, 8-hour leader-at-work leading system, tourism complaint accepting system and emergency response to make open and secret investigations on tourism markets, enhance supervisions on the work of major tourism areas and key tourism periods, in a bid to urge all tourism competent departments to perform their responsibilities of well supervising tourism areas under its jurisdiction, and urge every scenic spot to enforce their work of evacuating and guiding tourists during the peak hours, ensuring that the reception work during the Spring Festival can be carried out orderly.